...the 2016 Literary Award from the Royal Marines Historical Society on Saturday 12th November. You'll be £25.00 closer to your next £10.00 credit when you purchase A Marine at Gallipoli and on The Western Front. What's this? Harry Askin was 22 when he enlisted at Nottingham in September 1914 and was sent to train with the Royal Marines at Portsmouth. He set sail with the Mediterranean Expeditionary Force in late February 1915. On 25 April he was towed ashore to Gallipoli. So began a nine month ordeal of constant fighting and shelling on that bare and desperate Peninsula. In this diary he captures the atmosphere of danger and death, blazing heat in summer and rain and cold at other times. The smell of dead bodies was everywhere and while the fortitude of the troops was astonishing, at times confusion and panic prevailed. Harry was wounded twice in one day but the surgeon removed the bullet and he returned to the firing line. Harry was among the last to withdraw and his reward was to be sent to the Western Front. Again he was wounded. This is a stirring memoir which paints a vivid picture of the horrors of war. Enlisted aged twenty-two into the Royal Marines Harry Askin wrote the first chapter of his book during the voyage from Avonmouth to the Mediterranean in February 1915, the rest is taken from his diaries and memoirs. An epic story. Harry Askin who was born in 1892 joined the Royal Marines in September 1914 serving in Gallipoli and later the Western Front including the Battle of Ancre in 1916. He worked his way up through the ranks and was commissioned in 1918 before being demobilised at the end of the war. His diary, which had been edited by three of his granddaughters, captures the atmosphere of ever-present danger, death and hardship, the stink of rotting corpses, the fortitude of troops and the truly astonishing confusion and panic that prevailed from time-to-time. About one third of the book describes his service during the Gallipoli campaign including the voyages aboard various troopships. There are also descriptions of some of the naval incidents associated with this doomed campaign. The book contains some interesting illustrations which add to the story. This is an interesting and well written volume which provides a graphic account of the life of a First World War infantryman. A good read. 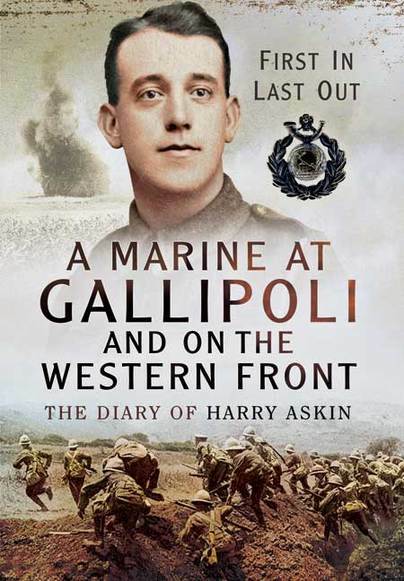 This is a very well written account and the chapters on Gallipoli are superb. One of the best of the 'new' memoirs that have been published during the WW1 Centenary. Published to the usual high-standard by Pen & Sword. A remarkable, very well written and comprehensive memoir... Most highly recommended.